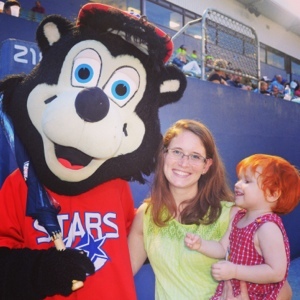 Our lifegroup decided to take a week off of our typical meeting routine and go to the Huntsville Stars minor league baseball game Tuesday night. This is the Stars last season in Huntsville before they relocate to a new city...so we wanted to hit up a game before they leave. The weather was a little dicey but we risked it and managed to stay dry. The bottom fell out twice, but we were able to make it to shelter under the stadium and the rain storms only lasted a minute or two. It did make it breezy and not crazy hot which was nice. Perry had a great time running around between us in the stands and meeting Homer the mascot (skunk?!? )...and enjoying his first funnel cake. He was a trooper and stayed awake and happy way past his bedtime. 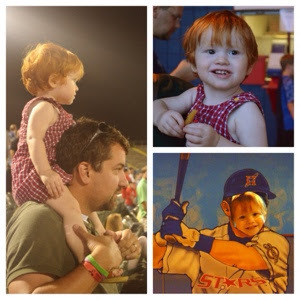 It made us reminisce about how fun minor league baseball games were back in Greensboro, and sadly the Stars don't hold a candle to the Grasshoppers in terms of atmosphere and fun (I mean who can compete with bat dogs). But it was a fun night hanging with friends outdoors and watching the game.